Spring is upon us, although there’s still a bit of chill in the air. Cats that have been mostly ‘hibernating’ indoors for the winter will be thinking of venturing outside as the weather warms up. In the meantime while the temperatures are still quite low, we've got some boredom busters for your cat to keep them occupied. Preventing boredom can help in avoiding the development of unwanted behaviours such as scratching furniture or tensions between cats in the household. Boredom busters are also great to get your cat some much needed exercise, which helps to keep obesity at bay. As you've seen from our previous blog post about feeding enrichment puzzles, cats love different ways to make feeding time more interesting. 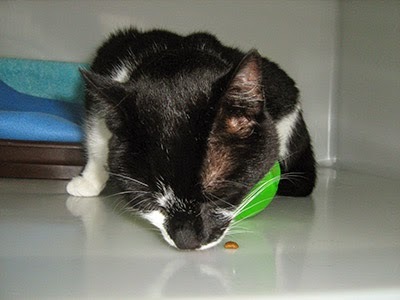 Feeding enrichment can be through either commercially bought items or homemade but all cats are different so it’s a case of experimenting to see what inspires your cat. 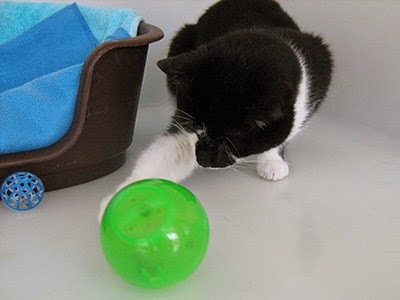 We recommend ‘showing’ your cat how to use the enrichment, which as well as being fun for you, helps your cat to understand the toy and hopefully prevents them getting bored or frustrated. With a commercially available food ball, we recommend placing it on the easiest setting (the one with the largest holes for the biscuits to fall out) and then batting around on the floor using your fingers. Just a word of caution though, don’t be fooled into doing it for a few hours thinking that the cat hasn’t got the hang of it when in fact they are perfectly happy for you to do all the hard work! Instead try playing with it for a couple of minutes in front of your cat and then step back and let your cat have a go. For a homemade variation on the food ball, you could try suspending a pot with some holes cut into it to allow the biscuits to fall out. Ice cream tubs, large yogurt pots or instant noodle pots are ideal. It follows the same principles as a food ball but from a different angle. Simply pop in some of your cat's daily food allowance, suspend the pot just above your cat's head height and watch them work to get the food out! Check out this video of one of our gorgeous CP cats enjoying this boredom buster. See how it takes much more time to get a single biscuit compared to being fed with an ordinary food bowl? Do have a look at our boredom busters videos on the Cats Protection YouTube channel too.